Our spacious Splash Mountain cabin contains 13 bedrooms on three levels so that everyone in your family and group can enjoy a comfortable night of rest! This cabin can even sleep up to 60 people with sleeper sofas and futons that are perfect for kids. There are also 14 bathrooms so that you can have plenty of privacy throughout your vacation. Whether you prefer to spread out in our king bedrooms or want to sleep in our queen bunk bed rooms with your friends, there is a plenty of room for everyone! Splash Mountain is situated in a stunning location in the heart of the Smoky Mountains and is just minutes from Pigeon Forge and Dollywood! The cabin is easily accessible via paved roads so you don’t have to worry about the hassle of driving through windy gravel mountain roads. After spending a day at Dollywood or exploring Great Smoky Mountains National Park, you can look forward to the quick drive back to your cabin! This amazing cabin features a fully equipped kitchen with all the modern amenities necessary for efficient and easy meal preparation! When staying with a large group or family, there is nothing more convenient than being able to cook all of your meals in the comfort of your own cabin. This saves a tremendous amount of time and money from dining out at restaurants, making your stay at Splash Mountain even more affordable! Our Pigeon Forge cabin with swimming pool also features an awesome selection of entertainment options! Splash Mountains features a state-of-the-art theater room complete with theater style seating and an 80 inch HD television. Just imagine spending your nights watching some of the biggest blockbuster movies on the big screen! As if that wasn’t enough, the cabin also has a fun game room with a pool table where you can play to your heart’s content. If you just feel like relaxing, dip into the bubbling hot tub on the deck and enjoy the fabulous view of the Smokies! While there are many highlights in our Splash Mountain cabin, the most exciting amenity is undoubtedly the full size indoor swimming pool! Just imagine being able to step out of your bedroom and walk downstairs to your very own private pool! The beautiful pool area features large windows that overlook the mountains, which adds even more to the appeal. Since you can enjoy swimming all year round in this refreshing pool, don’t forget to pack your bathing suit! 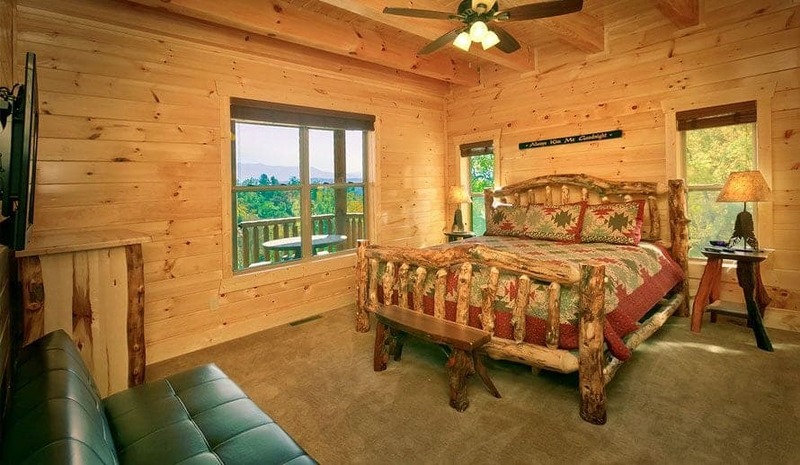 Check out our newest Pigeon Forge cabin with swimming pool today to plan your vacation to the Great Smoky Mountains! We look forward to seeing you soon at Large Cabin Rentals!